Hello! I have written three books and it is my sincere hope that you find them helpful in your creative journey. 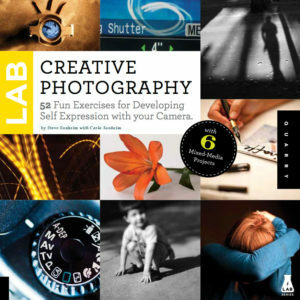 “Creative Photography Lab,” the fourth book listed below, is co-written with my husband, Steve Sonheim. Carla Sonheim is an artist and creativity workshop instructor known for her fun and innovative projects and techniques designed to help adult students recover a more spontaneous, playful approach to creating. Her innovative ideas are now collected and elaborated on in this unique volume. Carla offers a year’s worth of assignments, projects, ideas, and techniques that will introduce more creativity and nonsense into your art and life. 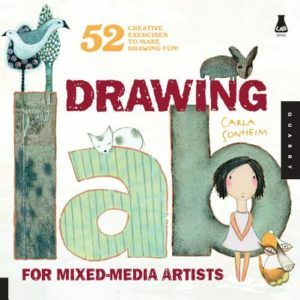 Drawing Lab for Mixed-Media Artists offers readers a fun way to learn and gain expertise in drawing through experimentation and play. There is no right or wrong result, yet, the readers gain new skills and confidence, allowing them to take their work to a new level. Purchase a signed copy directly from Carla. 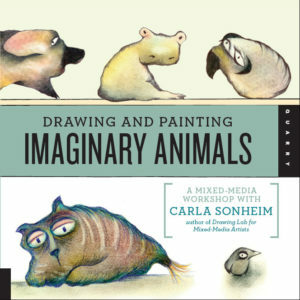 Carla Sonheim brings you another volume of exciting and liberating drawing exercises in her brand new book: Drawing and Painting Imaginary Animals. The book opens with three chapters of fun and freeing creative exercises in which you will draw a variety of fun animals and creatures as you learn to recover a more childlike approach to creating. The next ten chapters present a variety of mixed-media techniques that incorporate painting, artist’s books, transfers, and more, that will help you bring your amazing creatures to life and result in a unique, finished art piece. You will improve your drawing skills, expand your creativity, learn new art approaches, and have loads of fun doing it! A popular teacher and illustrator shares quirky, lively, interactive exercises to awaken the creative spirit in anyone. Carla Sonheim is an illustrator and creativity workshop instructor who’s beloved for her innovative projects and techniques designed to help anyone discover a more spontaneous, playful approach to creating. The goal: to get participants simply to play, for as little as ten minutes a day, with pen and paper, thoughts and images. It’s amazing to discover how a shot of silliness—creating like a kid does for just ten minutes—can positively inspire your outlook, your “real work,” and more. 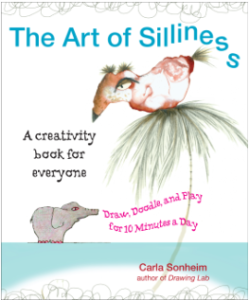 Fully interactive and illustrated with Carla’s charming drawings throughout, The Art of Silliness will delight the child in everyone. • 10/29/12: Interviewed on KUOW Seattle Public Radio “Weekday” Show. Listen here. • 10/30/12: Interviewed for The Chicago Tribune. – Provide easy exercises to help you discover your own personal style. – Tackle the technical stuff. – Explore a new way of seeing. – Turn your camera into a powerful tool of self-expression. – Help you capture amazing shots for your blog, social media, photo albums, your wall at home, or just for yourself. You don’t have to be a professional photographer or own expensive cameras and equipment to get inspiring shots. If you’ve ever taken a picture, this book is for you. Warning: once you get started, you’ll never want to stop.